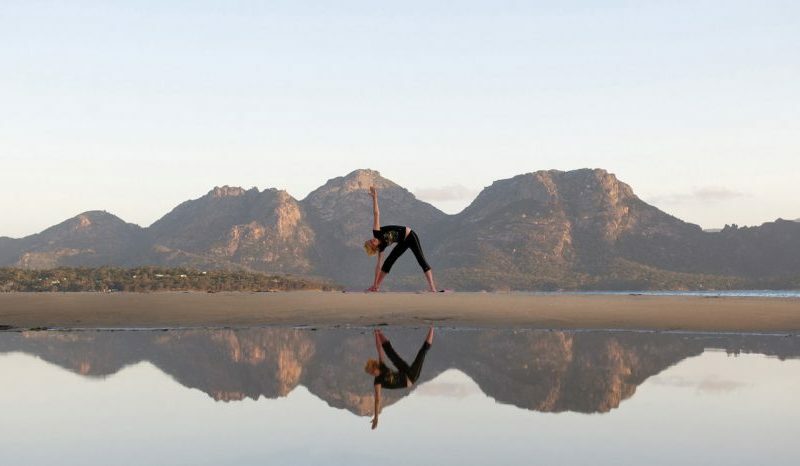 Enjoy private yoga sessions in the pristine outdoors, or in the private of your own suite, at Saffire Freycinet. Yoga by itself might just help you achieve inner-peace, but practicing it at one of these handpicked luxury yoga retreats & hotels almost guarantees enlightenment. Whether you’re in need of some R&R, or simply after a getaway that can help to cleanse you; mind, body and soul, these escapes are sure to nourish your soul and reset your batteries. We’ve scanned the country to put together a list of 10 retreats you need to try at least once in your life. The Samira Yoga Lookout at Gaia Retreat and Spa sits atop the highest point in the Ballina Shire. While many flock to Byron Bay for the superb surf and merry nightlife, others journey here to find tranquility and relaxation. The Samira Yoga Lookout at Gaia Retreat and Spa Byron Bay sits atop the highest point in the Ballina Shire. Take in the stunning scenery that stretches from the Pacific Ocean to the Nightcap Ranges while you practice strength and flexibility with your personal yoga instructor. 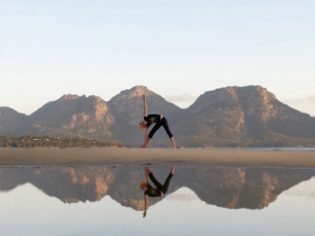 The breathtaking and isolated Saffire Freycinet Tasmania offers an invigorating spa regime and a range of wellbeing programs. Each suite has its own yoga mat. Enjoy a calming yoga session on site or in the comfort of your lustrous timber suite on Tasmania’s east coast. Hammocks dispersed amongst the courtyard provide an alluring space to cocoon yourself and spend the afternoon daydreaming afterwards. Grab a yoga mat and watch the setting sun cast shades of gold and pink over the tranquil turquoise waters of the Whitsundays. Qualia’s group sessions take place at dusk from the Hamilton Island Yacht Club, or in its Yoga Pavilion on site. A one-on-one session with your personal instructor will help you in designing a program to continue once you’ve returned home. Taking the unwinding up a notch at One and Only, Hayman Island. The sleek and modern One&Only Hayman Island offers movement, meditation and yoga classes set against a backdrop of the vibrant Coral Sea. Beginners and experts alike can choose to work up a sweat, or relax and unwind with an undisturbed 60-minute yoga session. You would never expect a canopied and tropical oasis only an hour away from the heart of the bustling Sydney CBD, but Billabong Retreat Central Coast is just that. Cabins are nestled among trees that overlook a natural, flower-filled billabong. Stress and tension can wave goodbye, with an abundance of carefully crafted relaxation and mindfulness activities to take part in. Alpacas roam the grounds of Samadhi Retreat in Daylesford. It is fitting that in the heart of spa country lies Samadhi Retreat Daylesford, an Oriental-style escape providing revitalising spa treatments and therapy. Alpacas roam the majestic grounds that surround the retreat, and ancient Chinese statues sit staring at the endless beauty of the Daylesford region. Enjoy one of the peaceful group yoga sessions that are run daily, or incorporate a one-on-one into your schedule. If the chance you might encounter Hugh Jackman lounging by the pool doesn’t entice you, we don’t know what will. Gwinganna Lifestyle Retreat, now co-owned by Jackman himself, is tucked amongst blossoming bushland in a valley overlooking the Pacific Ocean. Challenge yourself with intense hiking and creative dance classes, then take a breather in a movement, yoga or Pilates session. Start your day with a calming yoga class amid a lush green stretch in the heart of the Hinterland’s Cumberland Valley. Eden Health Retreat pays particular attention to healthy eating by using enticing local and bio-dynamic produce in its daily menu. From cardio boxing to laughing yoga, there are plenty of unique activities to incorporate into your personally designed daily schedule. Injidup Spa and Retreat looks out onto sweeping views of the Indian Ocean. Injidup Spa Retreat is located in an idyllic, vineyard-covered pouch of the Margaret River region. Made up of 10 private villas, each with its own plunge pool, Injidup is a luxury escape designed for relaxation. Meditation sessions are performed by Joel, a former Buddhist monk who previously studied in Sri Lanka and India, while yoga and a variety of spa treatments are also on offer. A vast 4,000-hectare estate purely dedicated to revitalisation and meditation – you can’t get more secluded than that. Withdraw for a week or two and return feeling utterly recharged. Movement and yoga classes at Mullum Sari Mullumbimby are intended for any experience level. Learn about the science and art of the practice, or just unwind in a soothing one hour session.